Global warming poses an important threat to our planet’s diversity. A number of studies have shown the effects of ocean’s higher temperatures for example on species distribution and habitat shift. Coral reefs are very diverse and valuable ecosystems. They support a huge biodiversity with more species per area than any other marine habitat, and are of great value to millions of people providing coastal protection from storms as well as nurseries for important fisheries. Coral reefs are also an important source of medical advances and tourism revenue. In a recent study, Figueiredo and others (2014) tested the effects of temperature on coral larvae survival and dispersal using a dynamic model. To calibrate the model, the authors used three coral species Cyphastrea japonica, Favites stylifera and Acropora millepora (Figure 1) in laboratory experiments to estimate the proportion of larvae that were successfully settling in their natal reef at different temperatures (27, 29 and 31°C). To measure larval survival, they used 50 embryos in glass jars with filtered seawater for each temperature treatment and counted the number of live larvae daily. To estimate larvae recruitment (when larvae settle and are added to the population), the authors used ceramic settlement tiles and 200 embryos for each temperature treatment. The tile was removed and replaced by another one and the number of larvae completing metamorphosis (settlement) was immediately counted. 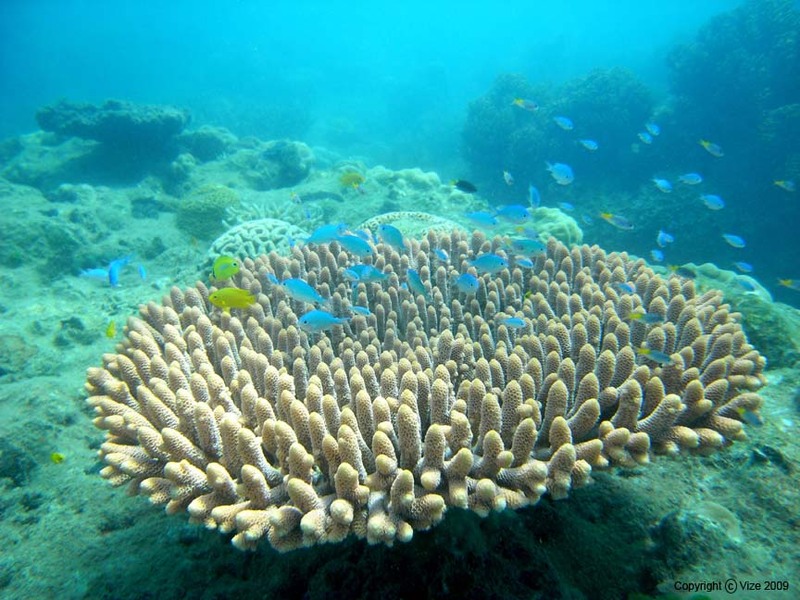 The authors found that the corals C. japonica and A. millepora have higher mortality rates at warmer temperatures. The results suggest that higher temperatures will increase local retention of coral larvae on reefs with mean residence times (or the average time a water molecule will remain in a body of water) of about 5 days or less (Figure 2). This implies that on more isolated reef systems such as Hawaii or French Polynesia the fact that more larvae are being retained in their birth reef is likely to increase the resilience or ability of the population to recover from minor disturbances. However, it also increases the time interval for recovery after severe disturbances because populations are highly dependent on locally produced larvae and just a small proportion of larvae is likely to migrate from nearby populations. Figure 2: Relative increase in the proportion of larvae that reach competence (the development stage when larvae have the capacity to undertake complete metamorphosis) while retained on the natal reef at 29 °C, green line and 31 °C, orange line. The dashed line represents values of local retention at present temperature (27 °C); thus, values above the dashed line represent an increase in local retention, whereas values below the dashed line represent a decrease in local retention. The consequences of local retention for relatively continuous reef systems such as the Great Barrier Reef would be different though. Weaker connectivity will affect populations that depend on larval exchange and recruitment and these populations may take more time to recover after a disturbance since fewer larvae will disperse from other reefs. This implies that coral reefs such as the Great Barrier Reef will be more vulnerable to ocean warming. It is still unclear how much populations will be able to adapt to increasing temperatures and there are also other factors that will influence coral reef persistence such as lifetime fecundity (reproductive rate) and post-settlement survival and growth. This study provides challenges and opportunities for marine resources management and highlights the importance of understanding how ocean warming will affect coral reef dynamics and connectivity.